Can you believe it's almost September?! Where has the year gone? Whilst the first, tentative, signs of Spring seem to be on their way - the nights don't come quite so quickly now, the flowers have started to bloom - the nights can still be bitingly cold, and comfort food is still very much on the menu. I made this baked pasta dish for dinner the other night, when I wanted something that would provide leftovers for the next few days of work. I actually made it on a weeknight, but it does take quite a while, so I'd suggest making it on the weekend, or when you have a bit of extra time on your hands. I was inspired, in structure, by Nigella's delicious pasta al forno from Feast - think lasagne, but with penne instead of lasagne sheets. I changed it up to suit my tastes, and used my own recipes for the different components. 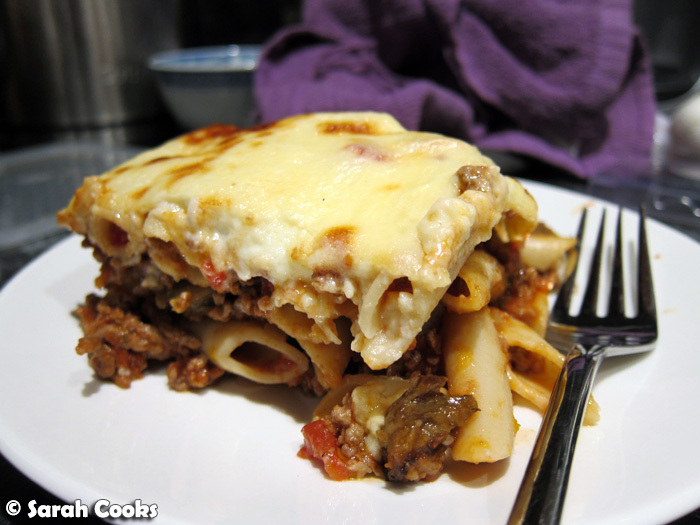 I made a beef bolognese sauce (I think all the cool kids are calling this a 'ragu' these days), stirred through some cooked penne, layered it in a baking dish with cubes of roasted eggplant, and topped it with lashings of cheesy béchamel sauce. So many of my favourite things, in the one dish. Dee-licious! Enough words, it's picture time! Mmm.. 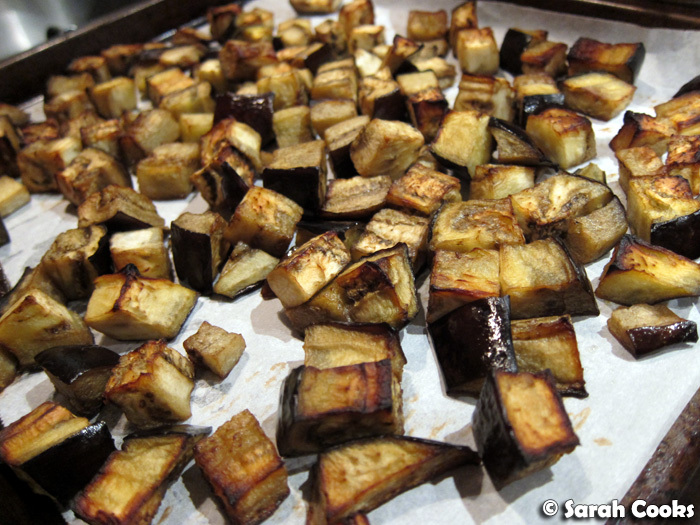 I love roasted eggplant, and they're so nice in little cubes, with their squidgy soft interior and slightly burnt, crunchy edges. I kept picking at these as I was making the rest of dinner - so addictive! Eggplants are like sponges, and you can definitely taste the oil that you roast them in, so use an olive oil that you really like. I. Love. Béchamel. Even more so when you chuck in a handful of grated cheddar cheese! Phew - busy working area! So, as I said above, I stirred the penne and meat sauce together, then layered it in a baking dish with the eggplant cubes. 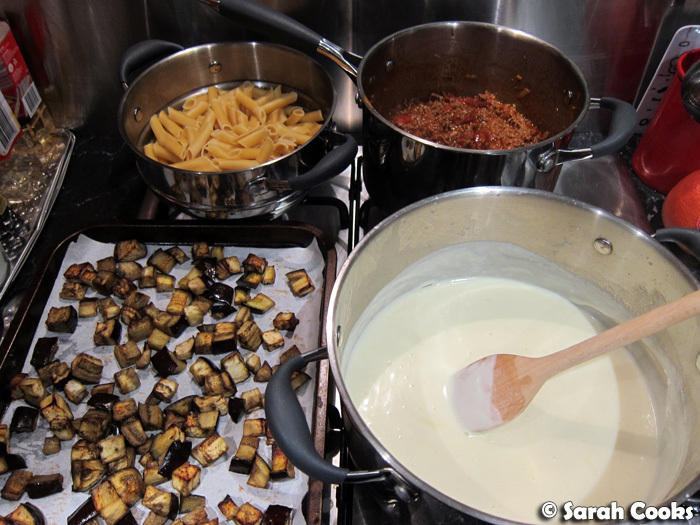 You probably could just stir the eggplant pieces through the pasta as well, but I didn't want them to break up or disintegrate. 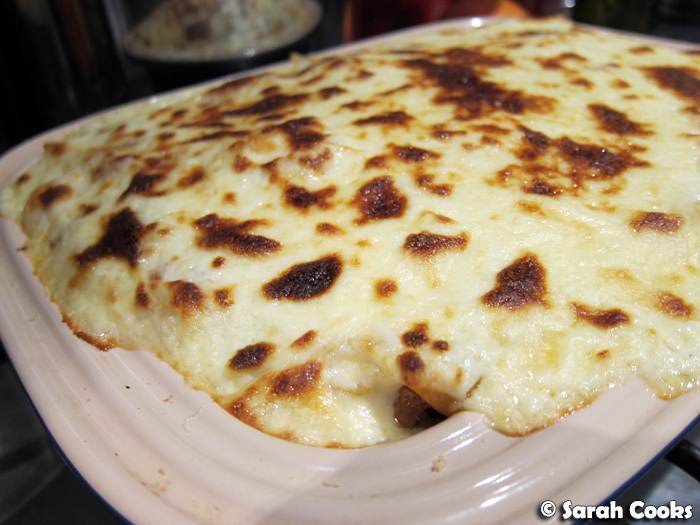 To finish it off, I just poured over the béchamel, grated some parmesan over and chucked it in a hot oven until it was browned and bubbling and blistering. (I was very hungry by this point, and found myself staring at the dish in the oven, yelling "cook, damn you, cook! ", hehehe). This recipe is quite labour intensive, with all the different components you need to prepare. However, no individual part is too difficult - and it tastes absolutely awesome. Once you bite into that gorgeous tomato-meat-eggplant-cheesy goodness, all that effort and time (and dirty pots & pans!) fade into the distance. Preheat the oven to 200C. 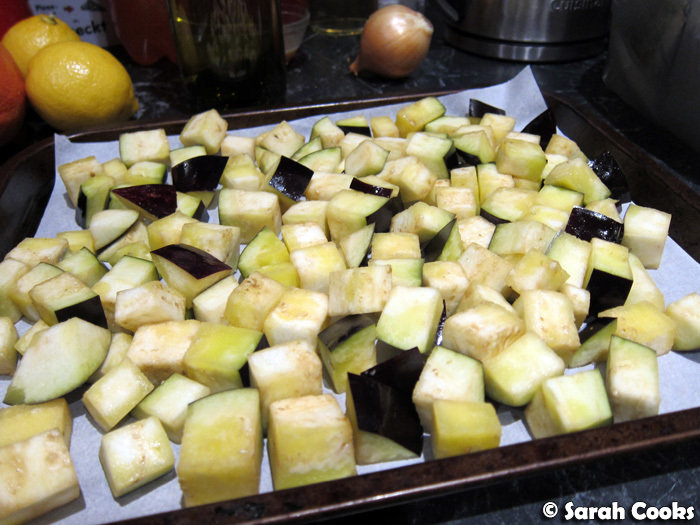 Cut the eggplant into approx 1cm cubes. Drizzle generously with extra virgin olive oil and toss to coat. Spread the eggplant pieces in an even layer onto a tray, and bake for 10-15 minutes, or until lightly browned and soft. Season generously with salt and pepper, and set aside. Meanwhile, cook the pasta according to packet directions. Drain and set aside. For the tomato meat sauce, heat some oil in a medium saucepan. Add the onions, garlic and a pinch of salt, and cook until softened, about 10 minutes. Add the minced beef, stirring to break it up. Once the meat is browned, add in the chopped tomatoes. Bring to the boil, turn down to a robust simmer and allow to cook for about 15 minutes, stirring occasionally. 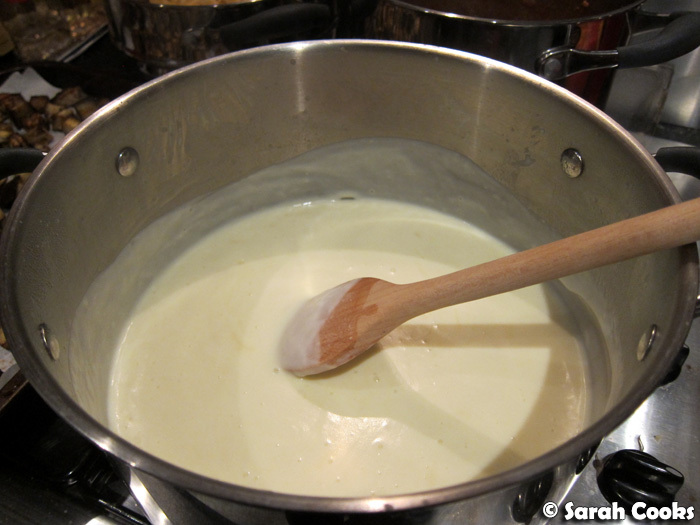 For the béchamel, melt the butter in a wide frying pan. (Any saucepan will do, but a wide and shallow cooking vessel means the sauce will cook faster). Add the flour and stir to combine. Cook for 1-2 minutes, stirring all the while. Gradually whisk in the milk. Cook, stirring, until the sauce is thickened and creamy. Off the heat, throw in the grated cheddar cheese, and stir to combine. Now, you are ready to assemble! 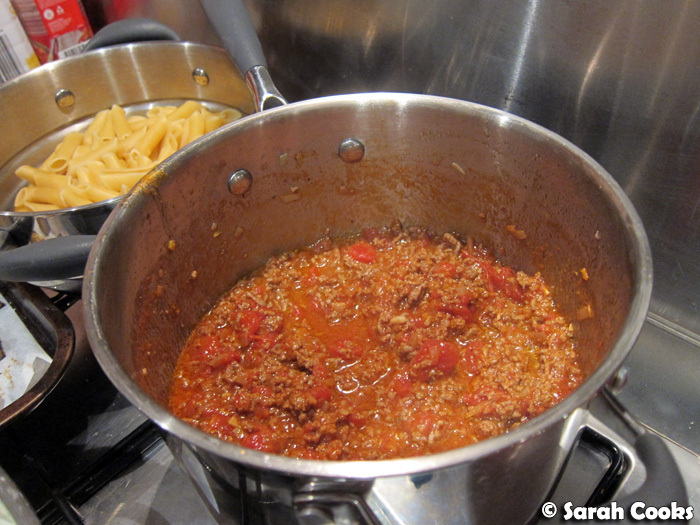 Tip the cooked pasta into the tomato and meat sauce, and stir to mix evenly. 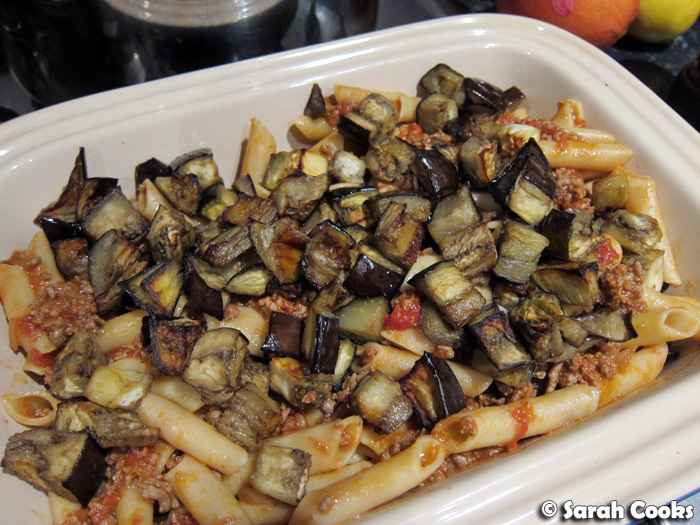 Layer the saucy pasta with the eggplants in a large baking dish. Pour over the béchamel. Grate the parmesan cheese over the top. Bake for 10 minutes or so, until the entire thing is heated through and the top has browned in places. (Put it under the grill to speed things up a bit!) Allow to sit for 5 minutes before digging in. Hi Sarah, this looks gorgeous! Only found your blogs recently and have been enjoying reading back on the posts, especially the Nigella ones! Oh my god carb goodness! This looks like the perfect comfort food and I bet it's even more delicious re-heated! Yay! Gonna make time to cook it this week :D Thanks for sharing!